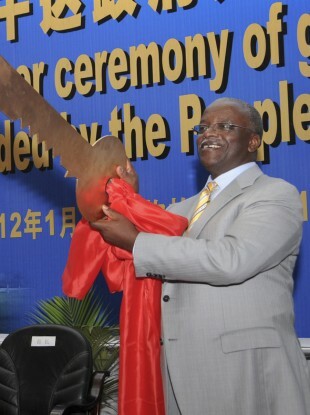 Ugandan prime minister Amama Mbabazi, pictured in January. €4m in aid from Ireland was transferred to an authorised account of the Office of the Prime Minister, a Ugandan auditor's report says. THE IRISH GOVERNMENT has suspended direct aid to the Ugandan government, and launched an immediate investigation, after it was suggested that up to €4 million in aid offered by Ireland had been misappropriated. Tánaiste Eamon Gilmore this afternoon said he had received a report from the Auditor General of Uganda, who had been carrying out a special investigation into the handling of aid funds by the Office of the Prime Minister. In a statement the Department of Foreign Affairs said the auditor’s report found “significant financial mismanagement in relation to the Peace Recovery and Development Programme for Northern Uganda”, which had been funded by Ireland, Norway, Sweden and Denmark. The report said up to €4 million in funding from Irish Aid had been transferred to unauthorised account belonging to the Office of the Prime Minister, Amama Mbabazi. This evening Gilmore said he had ordered an Irish team to travel immediately to Uganda to investigate the findings of the report and to report back next week. “I have asked our Ambassador in Kampala to underline to the Ugandan authorities the seriousness with which the Government regard the findings of the Auditor General and our insistence that the funds are restored without delay,” Gilmore said. The Government will not provide financial support under our development cooperation programme unless it is clear that Irish money is being spent for the purpose for which it was allocated. Pending the satisfactory resolution of this matter, I have instructed that no further aid funding should be provided through Ugandan government systems. GOAL’s Acting Chief Operations Officer, Jonathan Edgar, said his charity supported the decision. “GOAL has been advocating for many years for the strict policing of aid, to ensure that it gets to those people most in need,” he said. Fine Gael TD Pat Breen, the chairman of the Oireachtas committee on foreign affairs, also expressed his concerns. Email “Ireland suspends aid to Uganda after report suggests €4m fraud”. Feedback on “Ireland suspends aid to Uganda after report suggests €4m fraud”.